A vehicle seen mangled after crashing into a tree in a two-car collision that killed one person in Brea on Sunday, March 5, 2017. BREA, Calif. (KABC) -- An investigation was underway to find out what caused a violent crash that killed one person and injured three others in Brea Sunday morning. 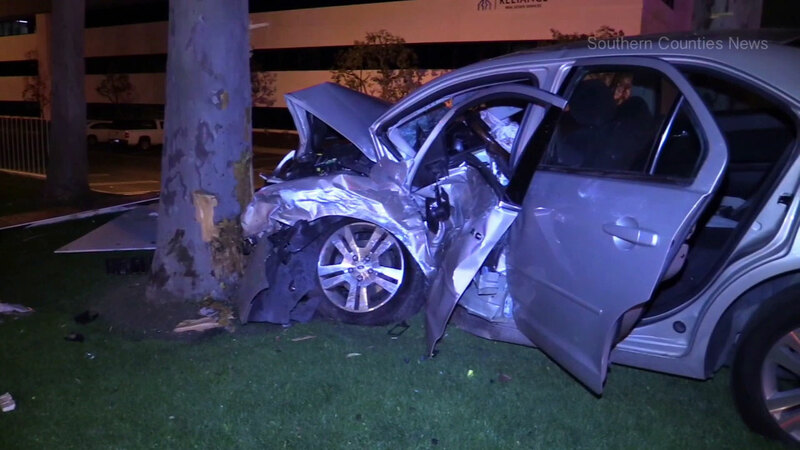 Two cars crashed at the intersection of Imperial highway and Kraemer Boulevard just before 3 a.m., Brea police said. According to preliminary information, Brea police said it appears a woman in a 2007 Toyota Corolla was traveling southbound on Kraemer when she drove through a red traffic signal and struck a 2006 Ford Fusion that was traveling eastbound on Imperial. One of the cars slammed into a tree and the other ended up on a sidewalk. Police said three people were pulled from the Ford Fusion and taken to the hospital in serious condition, though the injuries were not life-threatening, police said. The driver of the Toyota Corolla was not wearing a seatbelt and was ejected from the vehicle, police said. She was pronounced dead at the scene. Her identity was not released pending notification of family. Authorities said there was no information available yet to indicate whether alcohol or drug impairment was a factor.